The best focaccia bread recipe ever! Moist, flavorful, satisfying, and easy to make. This is simply the best bread I've ever eaten, made from my friend George's famous focaccia bread recipe. It will take a few hours to develop the dough, but the actual work involved is rather minimal. You can easily get a day's work done, while you're waiting for the bread dough to do its own thing. You see, bread dough is a living entity, and one secret to achieving its fullest potential is, well, time. Bacteria need time to grow, gases need time to expand (and provide structure), flavors need time to develop. But who has time? Well, if you're not willing to spend a little time on the preparation of truly divine food, you'll just have to do with grocery store quality. However, George has developed a method that requires planning, rather than time. If you want to eat superior focaccia for supper, you'll do the first steps in the morning, and then a few more steps throughout the day. So, if you don't work from home...think weekend. Another secret to this unbelievable focaccia bread is the use of Kanne bread drink, which is a sourdough extract from Germany. Unfortunately, it is currently not available for sale in the US. You may use kombucha or simply water, instead. I had great results with the full recipe amount of liquids in water. 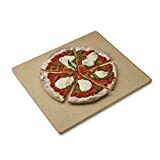 Also called pre-dough, poolish, or biga (Italian breads); a mixture of flour, water and yeast that is prepared and fermented before the actual bread dough in order to help with rise, texture and flavor quality of the finished product. George says: "Dried yeast has almost completely replaced fresh or cake yeast for the home baker. Years ago, dried yeast required re-hydrating before mixing, and the home baker had to take great care to use the correct temperature of water so as not to kill the yeast. These days, most dried yeast does not have to be hydrated, and it is best to follow the directions on the package. Frankly, even when the package says to mix directly into the flour and water, I always make a small poolish or slurry to dissolve the yeast and to make certain that the yeast is active. I make this slurry first thing while I am organizing the kitchen and all my ingredients, and this mix is generally ready to go after 10 or 15 minutes." Kombucha is a fermented tea product which contains acetic acid bacteria and yeast. It is widely available in grocery stores and health food outlets, and it comes in a large variety of flavors. Prepare the dough and mix it as described in the video...100 spoon beats! Then follow George's instructions for folding and resting; bake in a 500 degree oven for 18 minutes, then 5 minutes at 350 degrees. Now go wild with your toppings and eat the whole thing in one setting. 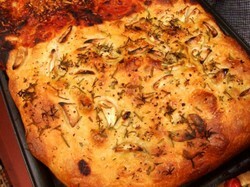 I have never made focaccia bread, but your article makes me want to bake some! 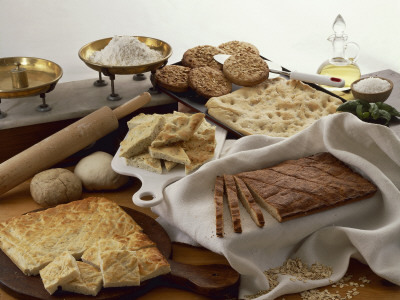 I love focaccia bread, thanks for sharing this great article! I love focaccia but have only ever eaten store bought bread. I bet it tastes even better home made. I should try this some time. KANNE is not sold in the US, Michelle. Try Kombucha instead. where do we get KANNE BREAD DRINK? I'm going to try this...thanks! Love bread, there's nothing better than the aroma of bread baking, love the focaccia bread recipe, great videos, nice character. I used to brew and drink kombucha...your making me want to do so again just to make this bread...it looks delicious and with the colder months coming here, the oven warming the kitchen will be a nice thing! This article will explore the quirky do's and don'ts of making quick breads. If you love the smell of delicious bread cooking, that Hostess bakery smell you can smell from your car, like fresh dounuts baking, then this will knock your socks off!